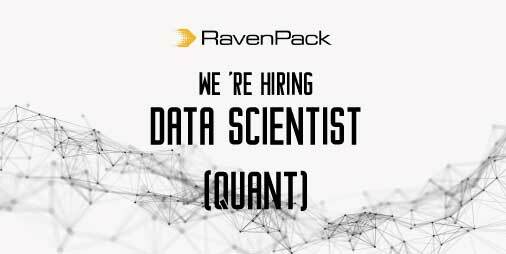 RavenPack is searching for a Quantitative Researcher to join the Data Science Team at our Spanish headquarter. As a Quantitative Researcher, you will be participating in the development of new products, as well as showcasing the value of our data for trading and investment purposes across various asset classes and time horizons. You will be reporting directly to the Chief Data Scientist and will interact with peers across various lines of business and technical teams to support projects that will span big data analysis and product development among others. The ability to communicate effectively in English both in writing and verbally is a must. Knowledge of Spanish is not a business requirement. European Union legal working status is required. Competitive compensation and a fun working environment. Relocation assistance available, but working remotely is not possible for this position. As a Quantitative Researcher, you will be part of a team focused on creating research papers to further build RavenPack’s brand as a thought leader in the alternative data industry. You will be working independently on practical academic researches and bringing them to life into the financial industry settings. Providing data insights to discuss your research with some of the top quantitative researchers in the industry. Communicating complex analytical concepts in a clear and concise manner to senior leaders. A PhD/MSc in an Applied Science, e.g. Statistics, Physics, Signal Processing, Machine Learning, Econometrics etc. or equivalent working experience in quant research. Experience in one or more of the following languages: R, Matlab, Python, SQL is seen as a plus. Outstanding quantitative, analytical and problem-solving skills, with the ability to develop original research. An enthusiastic and collaborative approach to research and the desire to work with colleagues as smart as you are. Experience working with large data sets, or noisy data would be an advantage. RavenPack is the leading big data analytics provider for financial services. Financial professionals rely on RavenPack for its speed and accuracy in analyzing large amounts of unstructured content. The company's products allow clients to enhance returns, reduce risk or increase efficiency by systematically incorporating the effects of public information in their models or workflows. RavenPack's clients include the most successful hedge funds, banks, and asset managers in the world.